I agree with GlobalX that it will take a lot more than a cool electronic gadget to reduce the global digital and economic divides. GlobalX hopes that “African farmers in the developing world will use their shiny new MotoFone to remind the rest of the world that wealthy countries spend $300 billion in protective measures and only $50 billion in aid to the developing world.” I hope so too. But, I know that these Motophones will be used in myriad innovative ways that we cannot imagine yet! GlobalX keeps a wireless mobile photo blog . 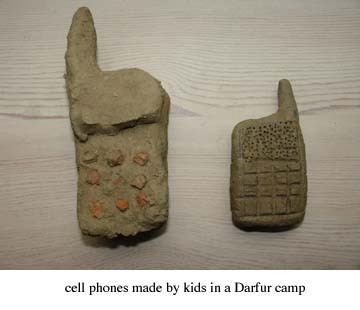 Also, thank you, Camilla for sending this photo of cell phones made by children in a Darfur camp after they saw aid workers’ phones. There will be more soon on Camilla’s video on everyday life in a Darfur camp – to be distributed by Witness. Ten African Countries will be home to a $10 million new cell phone project launched by the U.S. government, technology companies and health groups. The project will focus initially on HIV/AIDS. World Health Organization Assistant Director-General Howard Zucker stated: “The explosive spread of mobile phone networks across the developing world has created a unique opportunity to significantly transform how countries can tackle global health challenges.” (Reuters) Health workers will also be able to use the system to order medicine, send alerts, download treatment guidelines, training materials and access other appropriate information,” said Paul Meyer, chairman of Voxiva, the company that has designed the software that will be put onto the phones. “Managers at the regional and national level can access information in real-time via Web-based database.” (TechNewsWorld) It will be interesting to follow the “Phones-for-health” project. The long term vision of PFH is “that the scheme will be extended further into Africa and spread to Asia to address other infectious diseases, including malaria and tuberculosis,” the partners behind the launch said at the 3GSM World Congress in Barcelona, the annual European event covering 2G and 3G technologies (Feb 12th -15th, 2007). More than 60 percent of Africans now live in areas with mobile phone coverage and that figure is expected to rise to 85 percent by 2010 (Reuters). For some interesting new projects designed to bridge the “digital divide” in Africa see Global Voices. And, the Spiegel story, The Dirt Road to the Information Superhighway, maps out some interesting terrain with a look at how some of the ideas from the ivory tower are panning out on the ground. “The US economist C.K. Prahalad has long been a proponent of thinking of high technology as a form of development aid. In his book “The Fortune at the Bottom of the Pyramid,” Prahalad speaks about the need to stop seeing the poor as victims or as a burden on society. To him, 4 billion poor are the key to the next stage of trade and prosperity.” And, as the Spiegel writers note, Prahalad’s business model has at least one prominent follower. According to Bill Gates, the professor is offering “an intriguing blueprint for how to fight poverty with profitability.” Microsoft’s new Flexgo computers follow this blueprint closely.